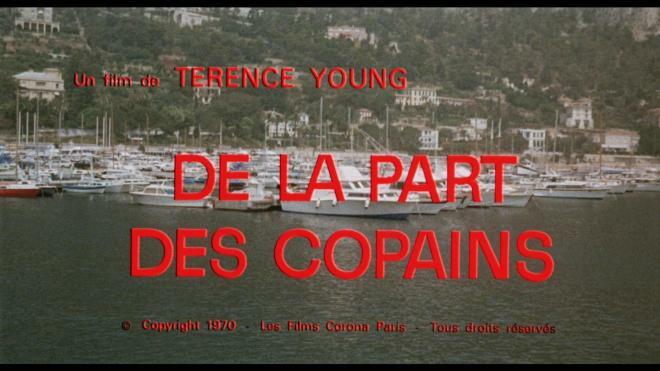 Joe Martin (Bronson) is an average successful businessman living in the south of France. By day he rents yachts and small watercraft to tourists. By night he keeps his friends on their toes playing poker. His wife Fabienne (Liv Ullmann) and his stepdaughter are happy. Everything is perfect - except when Joe's darker past comes calling. Years before, Joe broke out of a military prison with his Captain, Ross (James Mason), but took off with the getaway car when a cop was killed during the escape. Now after ten years, Ross and his spurned companions, the Italian Fausto (Luigi Pistilli) and the maniacal Katanga (Jean Topart), figure Joe owes them a debt worth ten years of hard prison time. Holding his wife and daughter hostage, Joe has no choice but to try and outwit Ross and the gang to stop their plan and save his family. Hot off his action streak with Dr. No, From Russia with Love and Thunderball and his tight tense thriller Wait Until Dark, Terence Young combined his best genres with aplomb in Cold Sweat. Loosely based on Richard Matheson's novel Ride the Nightmare, the show is one hell of a ride! At 94-minutes, the action comes hard and fast and doesn't let up until the finale. It takes just enough time to introduce Bronson's Joe Martin, shows you he's an okay dude and then his wife drops the bomb that someone keeps calling the house and hanging up. You watch him try to play it cool like it's nothing, but then they call again and this time he knows there's real trouble brewing. From the time his old pal Whitey played by Michel Constantin appears with a gun in his hand to the moment James Mason's Ross shows up, the movie keeps building tension and suspense with expert precision. When the do or die plot of a wounded Ross being the only one to hold the demented Katanga at bay while Joe fetches a doctor kicks in, the film shifts into high gear with one hell of a car chase sequence that is a literal race against time. Bronson has always had a fun knack for playing the more than capable everyman. Unlike some of his more famous efforts, he's not out there guns blazing when the action picks up. Here he using his hands and his brains to stay ahead of the bad guys in one clever trap after the next. James Mason delivers yet another sinister man-of-honor bad guy who holds all the cards. His American accent choice may be a bit off as he sounds more like Robert Shaw in Jaws, but he can still chew the scenery. It wouldn't be much of a Bronson movie without his real-life wife Jill Ireland and she's a hoot as a spaced-out hippy girl who, for some reason, is madly in love with Mason's Ross. 99% of the movie is perfect. A rollercoaster ride of plot twists and clever action with exceptional car chase material followed by an ending that felt like it was being pulled from Key Largo. That one last percent holding the movie back from being truly excellent is an overly simplistic and rushed ending. It really feels like a solid 15 minutes of material was lost somewhere on the cutting room floor. The cut from the fast and exciting car chase to the tight tense standoff on Joe's boat was very abrupt and played out too quickly for me. All of a sudden the show loses the need for tension and just wants to move on to its cliche' happy family ending. While it may stumble at the end, Cold Sweat delivers one tight and entertaining show. The rest of the film works so well you can forgive the need for a quick and easy exit. If you're a Bronson fan, you've got another fun flick to add to the collection! Cold Sweat arrives on Blu-ray courtesy of Kino Lorber and their Studio Classics label in a single-disc Blu-ray set. 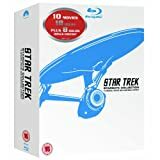 Pressed on a Region A BD-50 disc, the disc is housed in a standard sturdy Blu-ray case with reversible alternate artwork. The disc loads directly to a static image main menu with traditional navigation options. I wasn't able to locate information about the vintage of the 1.85:1 1080p transfer supplied for Cold Sweat, but I'm willing to wager that it had to have been fairly recent. The image genuinely looks fantastic. I came across this movie years and years ago on VHS and admittedly my memories aren't that recent but I was really impressed with the detail levels and the color pop. Details are robust throughout allowing you to appreciate facial features, the late 60s early 70s style clothing, and the impressive makeup work on James Mason as his character slowly bleeds out. Film grain is apparent but even giving the image a clean film-like appearance. Black levels are nice and inky giving the image plenty of depth. For the most part, the image is virtually spotless. There is minor speckling and shots with some optical effects like interior shots of Bronson's car during the big chase come packed with some extra dirt and debris but those looked baked in and not a transfer or restoration issue. All around, I'm very pleased with how this one looks. Cold Sweat rocks and rolls with an engaging English DTS-HD MA 2.0 mix. There is a great balance to the mix that I really appreciated with the film. There's plenty of slow-burn suspense allowing the mix to relish silent moments to build tension and then there's plenty of peaks to give the action the auditory release it needs. Through the low quiet moments and the loud action-packed sequences, dialogue is clean and clear - even James Mason's cagy American Accent that sounds like he's half from Maine and half from New Orleans comes through perfectly. Atmospherics get some excellent play during the big car chase sequence. It's great to hear the roar of that engine and the squealing tires and then it's a real treat when Bronson has to take the car off road! Levels are tip top without the need for monitoring. A rock-solid audio mix. While there may not be a vast assortment of bonus features for Cold Sweat, what's here doesn't disappoint. The audio commentary featuring film historians Howard S. Berger, Steve Mitchell, and Nathaniel Thompson is a great listen. The Car Chase Promo is also a fun bit of marketing you don't often see these days. What do you get for the person in your life who loves Charles Bronson movies? You get them Cold Sweat! It's not as famous as some of his other 70s efforts, but it's a sly thriller that keeps you on the edge of your seat all the way through. Plus, it's Bronson, if you're a fan your collection isn't complete without it. 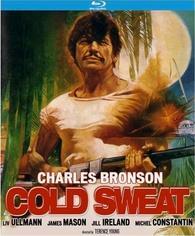 Kino Lorber Studio Classics brings Cold Sweat to Blu-ray with a great A/V presentation. Admittedly my early memories of the film on VHS aren't sharp, but this show looks and sounds great! Toss in a great audio commentary to punch up the bonus features and you've got a pretty decent Blu-ray package. If you're a Bronson fan, you'll get a kick out of it. Recommended.